In a brief report published Thursday, Mac Otakara, citing a reliable source, said Apple will soon begin selling AirPower in its stores, echoing identical claims made by The Apple Post in early February. While a specific date was not disclosed, the source said AirPower will debut sometime in March. The Japanese blog has a decent track record when it comes to predicting Apple product launches, but as usual, word of the tentative launch date is not official and should therefore be taken with a grain of salt. Along with its own channels, Apple is supposedly seeding AirPower to Authorized Apple Resellers like Best Buy, a common strategy designed to increase availability. The big-box retailer, and likely other outlets, will purportedly see AirPower availability on the same day as Apple stores. Today's report failed to mention wireless AirPods charging cases, which were unveiled alongside AirPower at September's iPhone event. Apple describes the AirPods accessory as "optional," suggesting there will be two AirPods SKUs, one with a case featuring a traditional Lightning connection and another incorporating inductive charging elements. According to The Apple Post, Apple intends to sell standalone wireless AirPods charging cases exclusively through its own retail stores, leaving third-party resellers to sell the item as a package with new AirPods. 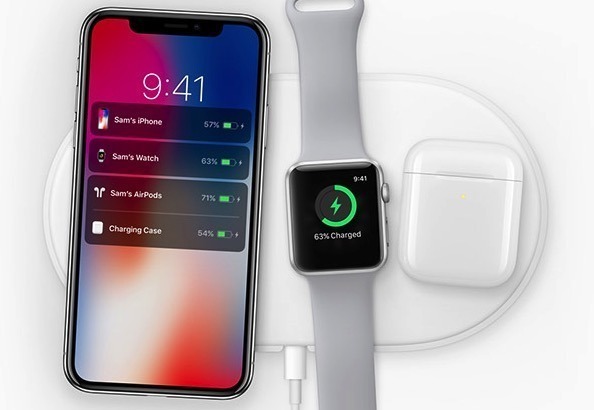 Announced at Apple's iPhone event in September, AirPower is a Qi-compatible inductive charging pad capable of detecting and juicing up multiple devices simultaneously. For example, AirPower boasts sufficient throughput to charge an iPhone, Apple Watch and the wireless-compatible AirPods case at the same time.